Cycle-Time of 2 Minutes or Less: With sustainability in mind, the Model TCL242-SS reduces curing times by up to 80%! Plus, the system can be turned off when no panels are present. Once panels are ready to be cured, the System only requires 5 minutes to heat-up. 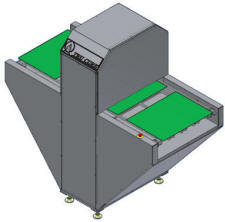 Small Footprint: With limited floor space in most facilities, the Model TC242-SS only requires 27 square feet.